The V610 is a beautifully designed camera that has instant appeal (everyone here loved it when it came out of the box), and the innovative twin lens/CCD system is a clever solution to the limitations of lens size that keeps most ultra compact cameras firmly in the 3x zoom range. As it stands, I'd say this; if you want a really compact camera that performs superbly in all conditions, forget about the 10x zoom; if you really want a big zoom in a compact package, look at the (cheaper and more capable, though bulkier) Panasonic TZ1. If you've fallen for the V610's good looks, you really, really need something this slim and don't find the issues mentioned here too much of a compromise I'm sure you'll love it. Me, I'd wait for the V610's successor, which will hopefully see Kodak iron out some of this promising but flawed camera's more annoying problems. 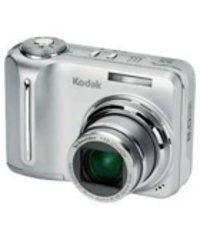 The Kodak EasyShare C875 is an 8 megapixel point and shoot with 5x Optical Zoom (schneider-Kreuznach lens) and 2.5 inch LCD. It features VGA video (30 frames per second), 32 megabytes of internal memory, SD memory card and PictBridge compatability. The C875 weighs 6.3 x 9.5 x 3.6 cm and will be available in stores late August 2006 for a retail price of $464USD. No official announcement from Kodak yet, but it's 249.99 ($464) from Argos. Kodak have today announced the Kodak EasyShare P712 - a top end (P is for Pro) digital camera with 7.1 megapixels, a 12x optical zoom lens (36 – 432 mm equivalent - image stabilized), improved high speed focussing, fast shutter lag, 30 frames per second VGA video, 2.5 inch LCD screen and high resolution electronic viewfinder. The Kodak EasyShare P712 will retail at £349.99 and should hit stores in June 2006. The Kodak EasyShare V570 is the world's first dual-lens digital still camera. The EasySahre V570 has two 'fold optics' lens/CCD packages mounted above each other, the first providing a prime 23 mm equiv. field of view, the second a 37-117 mm three times optical zoom. Both lens systems are mated to a five megapixel CCD sensor. One selling point is a built-in 180 degree panorama feature which is achieved with just three shots from the 23 mm equiv. lens. In addition to its dual lens design, the 5-megapixel V570 camera boasts a variety of notable features to enhance the photography experience, including in-camera panorama stitching, which automatically combines three pictures into a panorama photograph. Using the ultra-wide view in panorama scene mode, people can take in a 180-degree vista with just three shots — an industry exclusive.